I think we sometimes forget all the benefits we can get from adoption to use Diatomaceous in our lives and homes. So, as a refresher I have attached the benefits and what people are saying about it. But there is a new threat in the lives of those of us who live on the west coast. We are now exposed to excessive amounts of radiation coming from Japan. I have attached a corrected map of the flow. I attached one before but have evidence that it is not correct. Please, consider taking FFO DE internally as there is evidence that it work to protect against radiation and may even help cancer patients, remembering that is OMRI, USDA, FDA (gras) approved and listed in the International Food Codex. FFO DE is cleaner and finer and has more Calcium Bentonite and is better at de-toxing than what is mined in the states. 4. Healthier skin – Overseas, DE is used extensively as a health and beauty product for hair, skin, nails, bones, and joints. Tissue degeneration accelerates due to aging when connective tissue develops an increasing inability to retain moisture when left unassisted. Silica can help slow the degenerative process of connective tissue. With silica, vitality and life, which are often lost as the years accumulate, can be naturally maintained or even restored to your skin. Collagen, largely made up of silica, is the glue that holds us together. If our body has enough silica, the collagen will make us look younger. Silica helps with skin problems and injuries including itching, rashes, abscesses, boils, acne, calluses, warts, eczema, burns, frostbite, benign skin sores, insect bites and bed sores. If you regularly follow a silica regimen, your skin will keep its young look. You may want to keep your pet on the 1st month dose depending on his exposure to toxins, fleas and ticks. If you know there are herbicides (weed killers) or pesticides being sprayed where he lives and plays. 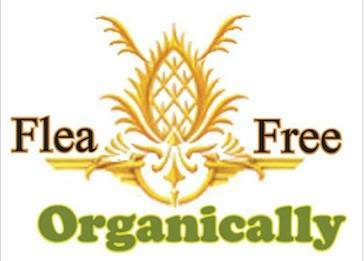 Flea Free Organically is superior to what is mined here in the States. It is finer, cleaner and contains more Silica (Calcium Bentonite).